Angola began its first national census since 1970 on 16 May 2014, a survey that could have far-reaching repercussions for government policy. Angola and 25 other nations from Africa on 10 June 2015 signed a historic free trade pact, Tripartite Free Trade Area (TFTA), that will ease the movement of goods across member countries in next five years. Once fully implemented, the 26-nation TFTA will be the continent's largest free-trade zone. Angola and other thirty-seven countries met internationally-set hunger eradication targets set for 2015 to halve the percentage of hungry people well ahead of time, the United Nations food agency revealed on 12 June 2013. The UNESCO World Heritage Committee on 8 July 2017 inscribed the town of Mbanza Kongo, vestiges of the capital of the former Kingdom of Kongo, in Angola as the World Heritage site. South Africa and Angola, through the Regional Spatial Development Initiative Programme (RSDIP) and the Industrial Development Institute of Angola (IDIA), signed an agreement on technical cooperation on 20 July 2012 that will further stimulate infrastructure development in Angola. Angolan athlete Jose Armando Sayovo and Palanca Nicolau (Guide) won the Men's 400m T11 race gold at the London Paralympic Games on 7 September 2012. Miss Angola, Leila Lopes, was crowned Miss Universe 2011 at the 60th annual pageant in Sao Paolo, Brazil on September 12, 2011. Leila became the first Angolan Miss Universe at the age of 25. Angola and Namibia on 22 September 2014 signed a currency conversion agreement in a development expected to help boost cross-border trade between the two neighbors. The agreement, which comes into force in early 2015, was signed between the National Reserve Bank of Angola and the Central Bank of the Republic of Namibia. Angola was elected to the UN Human Rights Council on 16 October 2017 for a 3-year term starting on 1 January 2018. Angola was elected as a non-permanent member of the U.N. Security Council on 16 October 2014 for the years 2015-2016. 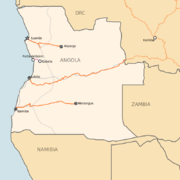 Angola on 17 October 2012 launched a $5 billion sovereign wealth fund to invest in domestic and overseas assets by funneling its vast oil wealth into infrastructure, hotels and other high-growth projects. Angolan journalist and civil rights activist Rafael Marques de Morais was awarded the 2013 Integrity Award by Transparency International for his efforts to fight corruption in Angola with his newspaper articles. Independence Day of Angola. Angola became independent on November 11, 1975 from Portugal after 14 years of independence movement. Angola was admitted as a member of the United Nations (UN) on December 1, 1976. Angola is firmly committed to the UN's agenda of peace, environment, international law and human rights. Angola’s first communications satellite Angosat-1 was successfully launched into orbit from Baikonur cosmodrome in Kazakhstan on 26 December 2017.